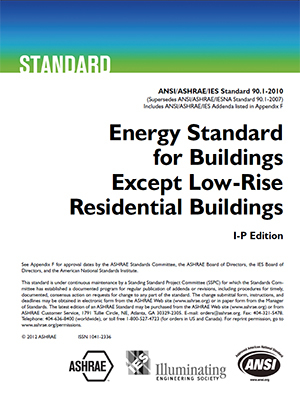 The purpose of this ASHRAE standard is to establish the minimum energy efficiency requirements of building design and construction, other than low-rise residential buildings. Read more about the International Energy Conservation Code (IECC), the standard that covers low-rise residential construction. Standard 90.1 has been a benchmark for commercial building energy codes in the United States and a key basis for codes and standards around the world for more than 35 years. This standard provides the minimum requirements for the energy efficient design of most buildings and offers, in detail, the minimum energy efficient requirements for the design and construction of new buildings and their systems, new portions of buildings and their systems, and new systems and equipment in existing buildings as well as the criteria for determining compliance with these requirements. It is an indispensable reference for engineers and other professionals involved in the design of buildings and building systems. ANSI/ASHRAE/IES Standard 90.1-2016, the tenth edition, is now available. The goal of this version, like those before it, is to "create a consensus standard that saves energy and is technically feasible and cost effective", according to Drake Erbe, the chair of the Standard 90.1 committee. Noteworthy changes include the addition of an envelope verification requirement and prescriptive guidelines for Climate Zone 0. Appendix G, previously used only to rate "beyond code" performance, can now be used as a path for compliance. Read the press release from ASHRAE. In early 2016, ASHRAE unveiled a new web application designed to automate Energy Cost Budget (ECB) calculations needed to show compliance with Standard 90.1-2010. Several states currently use this standard as a commercial energy code, including Florida, Iowa, New York, and Virginia. The revised standalone appendix for using Appendix G to show code compliance is available for purchase now in advance of the full code publication for those who wish to get ahead of the curve. The following states have adopted ASHRAE 90.1 directly (i.e. not as a compliance path through the IECC): Alabama, Indiana, Louisiana, Mississippi, New Jersey, Oregon*, West Virginia. Read more about ASHRAE 90.1-2013 and buy a digital or print copy here. PNNL estimates that ASHRAE 90.1-2013 saves a national average of 8.5% for source energy and 7.6% for site energy when compared to 90.1-2010. In late 2014, following a preliminary PNNL analysis of the energy savings provided by the 2013 standards, DOE issued a ruling establishing ANSI/ASHRAE/IES Standard 90.1-2013 as the commercial building reference standard for state building energy codes.